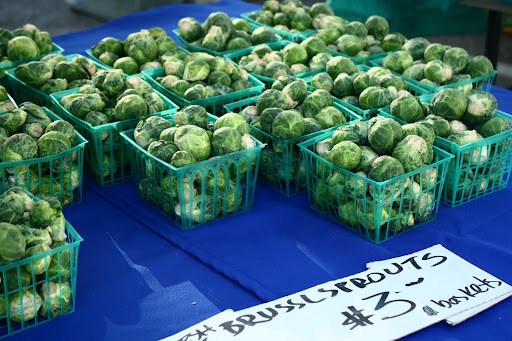 One of the many perks of living in sunny Southern California is the presence of farmers’ markets all year round. I love strolling among the massive white tents filled with beautiful fruits and vegetables picked fresh from the farms. I incorporate seasonal produce into my baked goods whenever I can, and it’s inspiring to know that the ingredients I use come from local growers rather than mass producers in other continents. Take Chuy Mendez of Chuy Berry Farm, one of several top-notch vendors I discovered at The Altadena Urban Farmers’ Market. Chuy grows his berries in hot houses all year round, treating the crops with lime oil and ladybugs rather than pesticides. 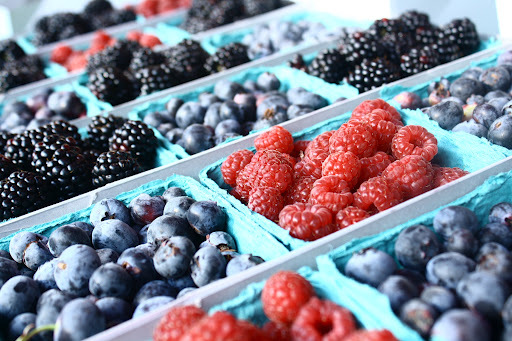 Mendez tightly manages his 10 acres of land, explaining why his berries are so naturally sweet and plump. I visited the Altadena market for the first time last week as an assignment for a feature in my school newspaper. All I can say is I can’t believe I hadn’t discovered this place earlier. The market, which debuted in late May and is less than 10 minutes away from my house, is Los Angeles’s best kept foodie secret. 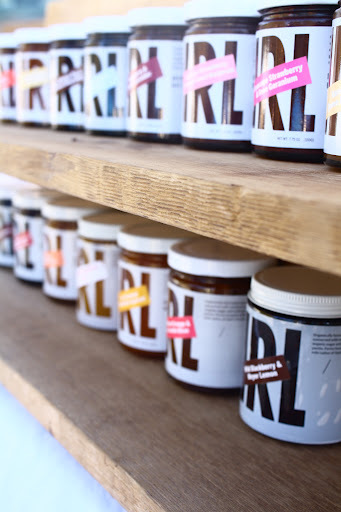 It boasts an impressive list of artisan vendors, including Sqirl Preserves, Plow & Gun Coffee Roasters, and Drake Family Farms Dairy, to name a few. 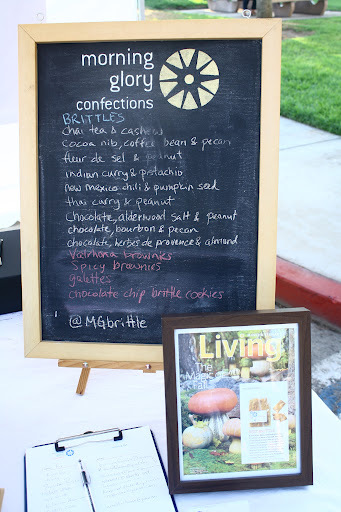 One of my favorite purchases was the Chia Tea and Cashew Brittle from Morning Glory Confections, a local company specializing in refined brittles. Founder Max Lesser creates baked goods such as dense Valrhona Chocolate Brownies and fruit galettes exclusively for the market. The thin chocolate chip cookie, filled with chunks of Lesser’s signature Fleur de Sel and Peanut Brittle, is irresistible. Other things I highly recommend trying are the smoked salmon from Shucked Oyster Bar and the aged “Glacier” Goat cheese from Drake Family Farms. The market is sandwiched in between a lush public park and a community garden, away from the traffic and noise of busy L.A. streets. The setting is intimate and relatively quiet compared to better-known markets such as Santa Monica and Hollywood. The smallness enhanced my shopping experience as I was able to comfortably float from one station to the next rather than get run over by double-decker strollers and scraped by reusable grocery bags. The people were so genuine and pleasant to be around, generously offering samples and patiently answering my questions. So what are you waiting for? Now it’s your turn to discover this food-lover’s hole-in-the-wall heaven and enjoy it just as much as I did. Makes 8-12 bars, depending on how big you cut them. 1. Preheat the oven to 300 degrees. Line an 8×8 square pan with parchment paper. 2. In a large bowl, combine oats, shredded coconut, flour, flaxseed, sliced almonds, chopped almonds, salt, and chocolate chunks, mixing very thoroughly until combined. In a small bowl, combine honey and coconut oil, microwaving on high power for 10 seconds at a time, stirring after each increment, until coconut oil is melted. Stir vanilla extract into coconut oil mixture, then pour the entire mix over the dry ingredients. 3. Using a wooden spoon or rubber spatula, stir until all of the ingredients are evenly coated in the coconut oil. Press the dough into the pan, pressing with the back of the spoon to smooth the top. Bake for 30 minutes, until the top is golden brown. Allow the bars to cool to room temperature before placing them in the refrigerator for an hour to harden. Remove from the fridge and cut into squares. Serve immediately, or return them to the fridge for later consumption. Now that reality has sunk in and school is in full swing, every day is a race from one class to the next, onto the yellow bus to tennis matches, and finally back home where I glue myself to a chair for long, treacherous hours of homework. In order to maintain my health and sanity in this crazy whirlwind of a schedule, I need snacks. And not just your run-of-the-mill sliced apples or suspiciously neon orange “flavor blasted” goldfish, but a hearty, satisfying, and delicious item that I can eat on the go. Enter Coconut Chocolate Granola Bars- a nutty, chocolatey, oat-y treat that is both satisfying and good for you. These trump my favorite store-bought granola bars in both flavor and freshness. They’re made from whole ingredients you can find in your pantry and that are easy to pronounce, unlike the mystery products listed on the backs of many wrappers. As hectic as my life has become in the past month, escaping to this nutritious homemade snack gives me the right boost of energy to keep going. 1. To make the meringue: preheat the oven to 200 degrees F. Line a baking sheet with parchment paper. On the parchment, outline circles of your cake pan with a pen. 2. Place the toasted hazelnuts in a food processor and pulse until finely chopped. In the bowl of a stand mixer equipped with a whisk attachment, beat the egg whites, cream of tartar, and salt on high speed until soft peaks form. Stream in the sugar and beat until the egg whites are stiff. Gently fold the ground hazelnuts into the egg whites. 3. Scoop the egg whites into a pastry bag and pipe meringue circles using the outlines on the parchment paper. Bake the meringues for 1 to 1.5 hours, rotating the pan half way through, until they are crisp. Allow the meringues to cool on the baking sheet for three hours. 4. To make the Genoise: Preheat the oven to 350 degrees F. Melt the butter and set aside. Place the eggs and sugar in a stand mixer bowl and place the bowl over a double boiler. Whisk the mixture by hand until it is hot to the touch. Place the bowl on the mixer equipped with a whisk attachment and beat the eggs until they almost surpass the bowl in height. Add the melted butter and whisk to combine. 5. Pour the mixture into a large bowl and sift the flour into the mixture in three parts, folding each time until just combined. Line the bottom of a 9-inch round cake pan with parchment paper and grease the sides with butter. Pour the batter into the cake pan, leaving out any clumps of flour from the bottom of the bowl that weren’t mixed in. Bake for 15 minutes or until a toothpick inserted into the center comes out clean. 6. To make the buttercream: Whip the eggs in the bowl of a stand mixer until they triple in volume. While the eggs are whipping away, place the sugar, water, and cream of tartar in a saucepot and bring to a heavy boil. With the mixer on medium speed, pour the sugar syrup over the eggs in a slow, steady stream. Continue beating for 10-15 minutes, or until the bowl cools to room temperature. Add the butter one pat at a time until the cream thickens. Add the vanilla extract and turn the mixture to high speed for the final 2 minutes. 7. To make the salted caramel chocolate ganache: Stir together the sugar and water in a medium heavy saucepan until the sugar is moistened. Heat on medium-high, stirring constantly, until the sugar dissolves and the syrup is bubbling. Stop stirring and allow the syrup to boil undisturbed until it turns deep amber (370 degrees Fahrenheit on an instant read thermometer.) Remove it from the heat and slowly and carefully stir in the hot cream. It will bubble up furiously. 8. Use a silicone spatula or wooden spoon to stir the mixture gently, scraping down to the bottom of the pan. Return the pan to very low heat, continuing to stir gently for 1 minute, or until the mixture is uniform in color and the caramel is fully dissolved. Remove pan from the heat and gently stir in the butter until incorporated. Pour the hot caramel sauce onto the chocolate in a large heatproof bowl. By the time all of the caramel has been added, the chocolate will be melted and the mixture will be smooth and shiny. Add the vanilla and the salt and mix to combine. 9. Scrape ganache into a bowl and let stand uncovered for 1 hour then cover with plastic wrap and let sit at room temperature for two more hours, until firm enough to spread as a filling and frosting. 10. To make the simple syrup: Bring the water and sugar to a boil in a saucepan and scrape in the vanilla bean seeds. Remove from the heat. 11. To assemble: Using a serrated knife, split the Genoise in half lengthwise. Using a pastry brush, soak the cake in enough simple syrup just to moisten it- do not make it soggy. On top of the first cake layer, place a dollop of buttercream and spread evenly until it is about half an inch in height. Stick the cooled meringue circle over the buttercream layer. On top of the meringue, spread a half inch layer of chocolate ganache. 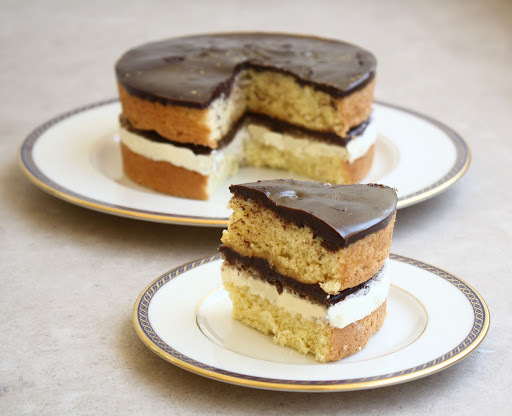 Place the second Genoise layer over the chocolate ganache and soak with simple syrup. Top the cake with another layer of ganache. Optional: finish by spreading buttercream on the sides of the cake and stick ground hazelnuts on the buttercream for decoration. Two whole years have passed since I first launched this blog and what a journey it has been. I have traveled to new and exciting destinations, visited amazing bakeries from around the world, and created a few memorable treats in my own kitchen. I have epitomized my motto and lived life one bite at a time. So, what better way to celebrate the occasion than with a decked-out layer cake? It’s been a while since a layer cake graced the front page of Let’s Live La Vida and in many ways, the differences between the two posts reflect my overall growth as a blogger. My palette has become more refined and I have become a more skilled and daring baker. By observing experts and learning from them, I feel more comfortable and at ease in the kitchen. This intricate layer cake demonstrates my development from a novice baker to someone who knows what she’s doing (most of the time). Genoise, a plain, subtly dry cake forms the anchor of this recipe. Genoise is designed to be soaked in simple syrup and layered with fabulous fillings as it does not possess much flavor on its own. Every bite contains a medley of distinct tastes and textures that blend seamlessly together. The rich salted caramel chocolate ganache complements the nuttiness of the hazelnut meringue and the fluffy vanilla buttercream ties the three together. Chocolate and hazelnut aren’t your favorites? Not to worry, Genoise can be endlessly adapted to suit your personal preferences. Soak it with coconut simple syrup and cover the sides with coconut buttercream and toasted coconut flakes for a divine coconut cake. Take advantage of summer’s trickling stone fruits by layering it with poached peaches and whipped cream and sprinkling the top with sliced almonds. Tweak the recipe proportions for a sheet pan, slice clean square pieces, and you have a lovely opera cake. I encourage you to step out of your comfort zone and try this cake. When you do, stick some imaginary candles on it and celebrate Let’s Live La Vida’s second birthday with me.